Generating electrical via solar energy is one of the most popular renewable energy source. Modular structured solar panels that work according to photovoltaic principles convert solar radiation into electrical energy. There are some ways of increasing the power produced by the photovoltaic panels. One of the most effective ways is to minimize the angel of rays from sun to panel surface by taking the right position according to the angle of the sun. This paper proposes an intelligent control method for solar tracking. This method uses a fuzzy logic controller applied to the DC motors in solar tracking system (STS). STS is designed and developed as dual axis. Fuzzy logic algorithm used in STS was applied separately in order to control DC motors which determine the azimuth and zenith angels of the system. Position error which is obtained by the help of encoders tied to the motors and error variation were taken as input of fuzzy logic algorithm, applied voltage to the motor was taken as output of fuzzy logic algorithm. Finally, results of the photovoltaic panel on the STS controlled by fuzzy logic are compared to those obtained by the photovoltaic panel system without STS according to instantaneous power performance throughout the day in Pinarhisar, Turkey. Experimental results show that the STS which uses fuzzy logic controller increases the efficiency of energy production from PV.
.	S. Sun, J. Brooks, T. Nguyen, A. Harding, D. Wang, and T. David, “Novel Organic and Polymeric Materials for Solar Energy,” Energy Procedia, vol.57, pp.79 – 88, 2014.
.	P. Oelhafen and A. Schuler, “Nanostructured materials for solar energy conversion,” Solar Energy, vol.79, pp.110–121, August. 2005.
.	R. Pradhan and B. Subudhi, “Design and real-time implementation of a new auto-tuned adaptive MPPT control for a photovoltaic system,” Electrical Power and Energy Systems, vol. 64, pp.792–80, 2015.
.	S. Daraban, D. Petreus, and C. Morel, “A novel MPPT (maximum power point tracking) algorithm based on a modified genetic algorithm specialized on tracking the global maximum power point in photovoltaic systems affected by partial shading,” Energy, vol.74, pp.374-388, Sep.2014.
. I. Stamatescu, I. Făgărășan, G. Stamatescu, N. Arghira, and S.S. Iliescu, “Design and Implementation of a Solar-Tracking Algorithm,” Procedia Engineering, vol.9, pp. 500-507, 2014.
.	İ. Sefa, M. Demirtas, and İ. Çolak, “Application of one-axis sun tracking system, Energy Conversion and Management, vol. 50, pp. 2709–2718 Nov. 2009. ISNAD TOYLAN, Hayrettin . "Performance of Dual Axis Solar Tracking System Using Fuzzy Logic Control: A Case Study in Pinarhisar, Turkey". 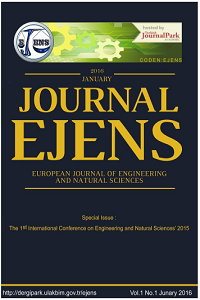 European Journal of Engineering and Natural Sciences 2 / 1 (February 2017): 130-136.